I have very mixed feelings about this establishment. First, let me say how impressed I was by the individual attention I was afforded by the young man at the bar. At about half my age, he nonetheless ministered to my needs without fault, and we exchanged some suitable banter. He was entirely polite without irony, and deserves a pay rise, I'm sure. 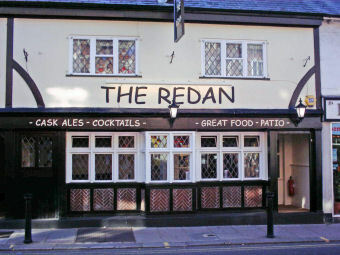 After a six mile walk we fancied a pint before we got back on the train and we chose The Redan. This is not the usual sort of pub that four guys over fifty would frequent but we didn't know that till we entered. We were the only customers, but it was 1530 on a Friday in March. Beer was surprisingly good. Barman was practising tossing his bottles as per Tom Cruise in Cocktail as per a previous reviewer but we had no blondes to compete against for service. Music was loud but I recognised both the Kinks and the Kings Of Leon so could have been a lot worse. Furniture and decor was sparse, no doubt for a good reason ! We probably wouldn't go back here but that is personal choice and not the fault of The Redan. We aren't its target clientele. This pub has since 2006 become an over 21's only Cocktail Bar. Green King IPA is served aswell. The Pub has recently come under threat of demolishion by the local Council who intend to give the area a facelift and increase retail outlets. As you can see from the picture, this is not an ugly building in need of a facelift. It is a thriving business, and would be a great loss to the area. The service in this place is the slowest I've ever seen anyone over 18 and not blonde need not bother as the bar staff try thier hardest not to notice you until they have done thier Tom Cruise impression. Once they've pulled you have no hope! Go somewhere else. popped in this place a few times while down from Manchester on a course. The cask ale was good and the people were friendly. Nice place.